What Personal Information About Customers Does the CVB Gather? Information You Give Us: We receive and store any information you enter on our website, send by phone, fax, email, or US Post. You can choose not to provide certain information. We use the information that you provide for such purposes as responding to your requests, improving our services, and communicating with you. Information From Other Sources: For reasons such as improving personalization of our service (for example, providing special offers that we think will interest you), we might receive information about you from other sources and add it to our account information. We also sometimes receive updated delivery and address information from our shippers or other sources so that we can update our records and communicate more easily. At your request, we will send you our brochures and special promotions or offers. Our e-Specials are promotional emails about special offers, attractions and events happening in and around Carolina Beach, North Carolina. You will receive approximately eight e-Specials a year. You can unsubscribe at any time, directly from the prominent links within each e-Special, by telephone at 1-877-406-2356, or by emailing us at visit@wilmingtonandbeaches.com with "Remove from your mailing list" in the subject line. We do not share our email lists with anyone. Does The CVB Share the Information it Receives? Information about our customers and industry partners is an important part of our business, and we are not in the business of selling it to others. We do not share your information with any organization or business outside of the CVB. How Can I Get Access to My Information? As access is strictly limited, we do not allow access to this information online. Requests should be made via the following channels: By mail attention CVB, 505 Nutt Street, Unit A, Wilmington, NC 28401, by email at visit@wilmingtonandbeaches.com or by telephone at 1-877-406-2356. 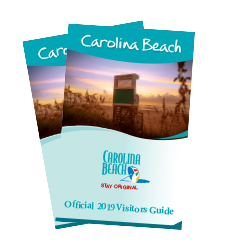 As discussed above, you can always choose not to provide information, even though it might be needed to take advantage of CVB services, or to receive more information about Carolina Beach. If you do not want to receive e-mail or other mail from us, please contact us by telephone at 877-406-2356 or email us at visit@wilmingtonandbeaches.com with "Remove from your mailing list" in the subject line. You may contact us by mail attention CVB, 505 Nutt Street, Unit A, Wilmington, NC 28401, by email at visit@wilmingtonandbeaches.com or by telephone at 1-877-406-2356. Please thoroughly explain your question or concern and we will try to resolve it. Any third party, including our affiliates and subsidiaries, including through any application or content (including advertising) that may link to or be accessible from or on the Website. Our Website is not intended for children under 13 years of age. No one under age 13 may provide any information to or on the Website. We do not knowingly collect personal information from children under 13. If you are under 13, do not (a) use or provide any information on this Website or on or through any of its features, (b) register on the Website, (c) use any of the interactive or public comment features of this Website or (d) provide any information about yourself to the Organization, including your name, address, telephone number or e-mail address. If we learn we have collected or received personal information from a child under 13 without verification of parental consent, we will delete that information. If you believe we might have any information from or about a child under 13, please contact the Organization as provided below. that is about you but individually does not identify you; and/or about your internet connection, the equipment you use to access our Website and usage details. Directly from you when you provide it to the Organization. From third parties, for example, our travel and business partners. Information that you provide by filling in forms on our Website. This includes information provided at the time of registering to use our Website, subscribing to our service, posting material or requesting further services. We may also ask you for information when you enter a contest or promotion sponsored by the Organization, and when you report a problem with our Website. Records and copies of your correspondence (including e-mail addresses), if you contact the Organization. About your online activities over time and across third-party websites or other online services (behavioral tracking). We use common Internet technologies, including Google Analytics and "cookies" to collect information about users so that at any time we can provide the best possible functionality and develop our information services. To provide you with information, products or services that you request from the Organization. Specifically, we use Google Analytics to measure and monitor usage trends of the WilmingtonAndBeaches.com website. We also use data from Google&apos;s Interest-based advertising or third-party audience data (such as age, gender and interests) with Google Analytics in order to periodically evaluate whether the content on the Website is well-matched to audiences actually using our Website and how to tailor and improve said content to appropriate user audiences if it can be improved through content changes and updates. To third parties to market their products or services to you if you specifically opt-in to such use. For any other purpose disclosed by the Organization when you provide the information. If we believe disclosure is necessary or appropriate to protect the rights, property or safety of the Organization, our customers or others. Disclosure of Your Information for Third-Party Advertising. If you do not want the Organization to share your personal information with unaffiliated or non-agent third parties for promotional purposes, you can opt-out by sending the Organization an e-mail stating your request to visit@wilmingtonandbeaches.com. Promotional Offers from the Organization. If you do not want to have your contact information used by the Organization to promote our own or third parties&apos; products or services, you can opt-out by sending the Organization an e-mail stating your request to visit@wilmingtonandbeaches.com. If we have sent you a promotional e-mail, you may send the Organization a return e-mail asking to be omitted from future e-mail distributions. Targeted Advertising. If you do not want the Organization to use information that we collect or that you provide to the Organization to deliver advertisements according to our advertisers&apos; target-audience preferences, you can opt-out by sending the Organization an e-mail stating your request to visit@wilmingtonandbeaches.com. You may send the Organization an e-mail at visit@wilmingtonandbeaches.com, or mail or call to the contact information below to request access to, correct or delete any personal information that you have provided to the Organization. We cannot delete your personal information except by also deleting all information you provided. We have implemented measures designed to secure your personal information from accidental loss and from unauthorized access, use, alteration and disclosure. To ensure that the processing of information is carried out in a safe manner, only specifically authorized persons at Wilmington and Beaches CVB, and our subcontractors and system suppliers (see below) will have access to the information you provide us. The number of employees with such approval is limited. Access to information is secured by access mechanisms.